Timing belt is one of those parts that can snap with no warning or indication. What is worse is if you are not careful you can cause further damage to your vehicle by trying to start it after the timing belt breaks. The best thing to do is to call us and have your car towed to our facility so we can install the new timing belt. If you were driving slowly and your car died with no indication or stalling it is probably your timing belt. Do not try to start your car as this might cause further engine damage. We offer free local towing. Call us right away so we can help you. The timing belt, or timing chain in certain cars, is a drive belt that integrates the rotation of the engine’s crankshaft and camshaft with the opening and closing of your engine’s valves. Anytime the crankshaft turns, the timing belt turns the camshaft, which opens and closes the engine valves to allow the pistons to move up and down. Your car’s engine operates in four phases: intake, compression, combustion, and exhaust. During the intake phase, intake valves open and exhaust valves close as fuel and air enter the cylinders. As the air and fuel is mixed, compressed, and ignited by spark plugs during the compression and combustion phases, the valves close. The remaining air and fuel is pushed out of the exhaust valve during the exhaust phase. The timing belt is responsible for synchronizing this process and for opening and closing valves during normal engine operation. 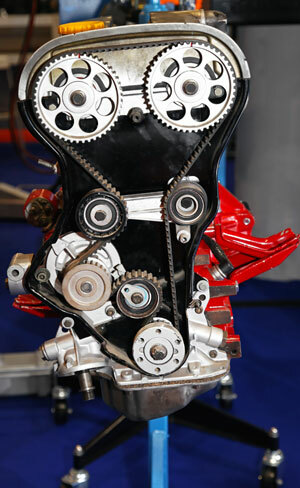 Refraining from a timing belt replacement can result in total engine failure. A worn out or stretched belt can interrupt the working order of the valves and pistons, which can cause a piston hitting a valve and damaging the engine. Timing belt failure warning signs include rough idling or problem starting the engine. Cracks on the belt, which is made of reinforced rubber, are a sign that it may soon break. Replacement of your timing belt will help maintain your engine performing as it should and assure you avoid costly future repairs. During our replacement service, your belt will be replaced and synchronized with the crankshaft and camshaft to restore proper operating precision and order. Referring to your owner’s manual will help determine the appropriate service intervals for timing belt maintenance.